Fitness isn't about burning calories alone. It’s about building a healthy body & consequently a healthy mind. With a rich blend of nutritious diet & effective exercise we at BODYWORKS provide our clients with lifestyle programs that result in permanent fat loss without resorting to starvation. Our exercise programs are based on the science of functional training & are planned & executed following guidelines from Reebok University / ACSM & ACE. "Dieting is not dying without eating" is our nutrition mantra. Besides weight management we also conduct antenatal & postnatal programs. Holding a Bachelors Degree in Dietetics & a Post Graduation in Sports Science & Nutrition, Ms VENU ADHIYA HIRANI who founded BODYWORKS in 1995 is also a Reebok certified group exercise instructor & personal trainer.A certified obesity consultant from the All India Association for Advancing Research in Obesity (AIAARO), she specializes in obesity management & antenatal fitness. She has to her credit numerous articles both in print as well as web based media, regularly conducts health & fitness awareness programs for corporates/institutions & has also featured on television shows. She has been the content writer & presenter for Fitness Mantra on Vodafone Live! 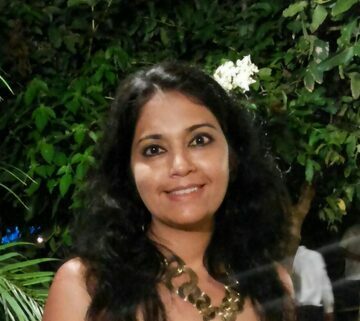 and content writer for Weight Watchers on Vodafone.She has been associated with Reebok as Mr Chetan Bhagat’s Nutritionist for the Reebok presents Reeboot 100 – The 100 day’s fitness challenge with Chetan Bhagat. Venu’SSS … Scientific, Supervised and Sustainable weight management solutions – Uh-huh the motto could not be more apt! Have been associated with Venu Hirani for over a decade now. She put me on a nutrition plan and exercise regime that completely transformed me into a very health conscious person. This program has not only motivated me to eat healthy but to really pay attention to my overall health.Thanks to Venu for all these lifestyle changes due to which I had lost 25kgs in the initial years of my association with her. These changes also impacted my family as I got them to also eat healthy and stay fit.To top it all off, Venu guided and supervised my exercise routine when I was down with a medical condition recently. She not only very patiently helped me sail through this phase but also helped me lose 10kgs in about 6 months’ time. What an awesome combination!!! Venu is an excellent professional with a wealth of knowledge and a passion for what she does. When it comes to Health, Nutrition, Exercise, there’s just one name that I can ever think of – Bodyworks. Besides, the studio itself is so motivating that I keep looking forward to the workouts and the company of happy, cheerful and friendly group mates.